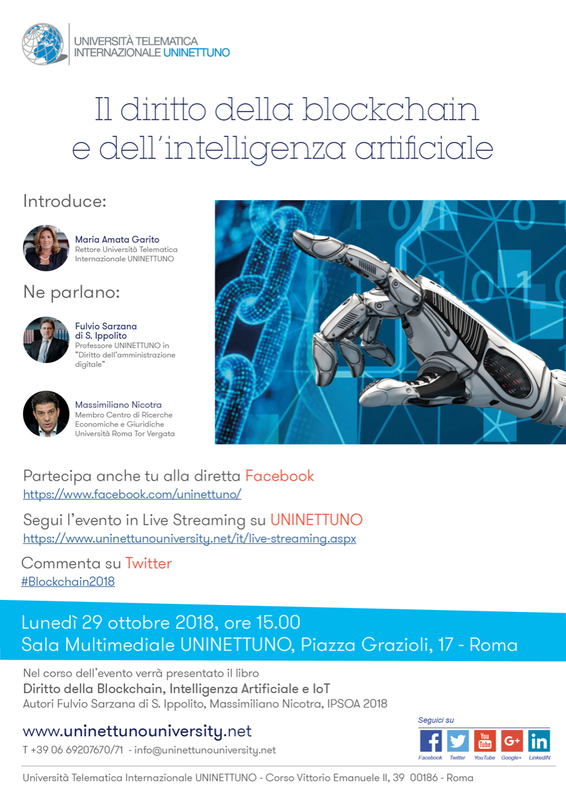 Digital Talk " Law in Blockchain and Artificial Intelligence "
Protagonist of the next UNINETTUNO Digital Talk will be the book “Diritto della blockchain, intelligenza artificiale e IoT (“The Law of Blockchain and Artificial Intelligence) by Fulvio Sarzana di S. Ippolito and Massimiliano Nicotra. This volume deals with juridical issues related to international and national regulations as regards blockchain and artificial intelligence. The text addresses the so-called “Internet 3.0”, expanding on each specific regulatory and contractual aspects using a clear and simple language and is enriched by a number of bibliographical references. Additionally, it includes a comparative study between the national strategies and those adopted in other countries such as France, United States, China, Russia, Arab Emirates, South Korea, Sweden, Mexico, United Kingdom, Japan, Baltic Countries and Malta.